ARTBA works with industry coalition allies to help advance the pro-transportation investment in the Nation’s Capital. 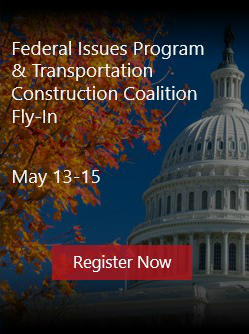 The Transportation Construction Coalition (TCC) is a group of 31 national associations and labor unions with a direct market interest in the federal transportation programs. Created in 1996 and co-chaired by ARTBA and the Associated General Contractors of America, the TCC focuses on the federal budget and surface transportation program reauthorization debates. TCC members can be found in every congressional district and provide a vital service to their communities by helping to improve the efficiency and safety of our nation’s highway infrastructure. ARTBA serves as vice chair of this U.S. Chamber of Commerce-led national coalition that is working to ensure the nation’s transportation infrastructure is improved to handle current and future demands. ATM represents transportation users and providers who are working together for a safer and more efficient transportation infrastructure system. The coalition promotes increased investment in infrastructure and fighting to streamline the burdensome approval process that significantly delays and even prevents critical transportation safety improvements. ARTBA is a member of the Waters Advocacy Coalition (WAC) Steering Committee. The WAC represents a large cross-section of the nation’s economy, including the construction, real estate, mining, manufacturing, forest products, agriculture, energy, recreation, and public health and safety sectors, all of which are vital to a thriving national economy and provide much needed jobs. Coalition members construct, operate and maintain critical infrastructure such as highways, bridges, railroads, tunnels, airports, electric generation, transmission, and distribution facilities, and pipeline facilities. Specifically, WAC concentrates on ensuring any Clean Water Act-related legislative proposals do not result in unnecessary federal overreach and regulatory burdens that are harmful to the nation’s economy.